As the cab drove up to the 15th century Villa Il Chiuso, belonging to the family of Earls "De Pazzi", located outside the centre of Florence, my wife, Karen and I sensed our visit with Visconti would be unique. We were fortunate to be able to spend time with Dante del Vecchio, the President, and one of the founders of this leading and innovative pen company. 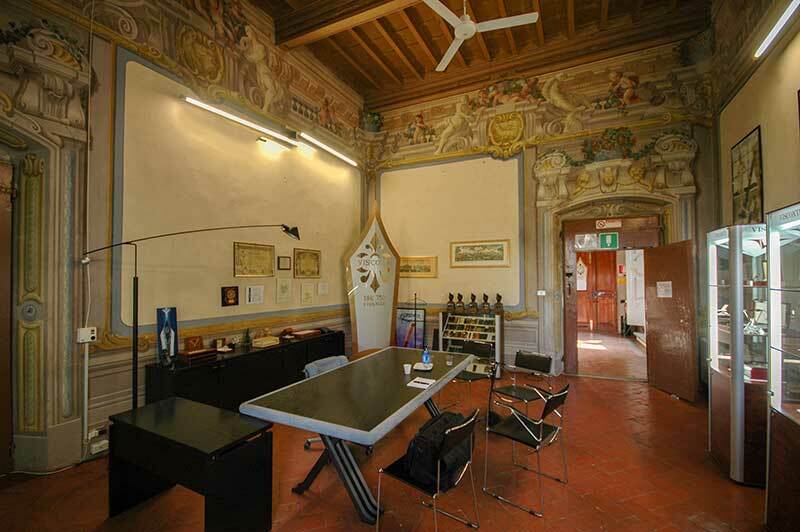 Visconti offices and manufacturing are in a section of a 15th Century villa, Villa Il Chiuso, just outside the centre of Firenze. The Visconti offices and meeting rooms are in the various rooms of the villa and have high, painted ceilings and a feeling of grandeur. The workshops are in the former cellars, mill and stables of the villa. Dante and his partner, Luigi Poli, were both pen collectors. They had concluded the market was missing the style and quality of pens from previous generations. They advanced their passion and commitment to design and create distinctive, quality pens by creating a new pen company. Looking back, Dante told me the driving force in the designing of their pens was passion rather than an extensive business plan. His goal was to create a pen with its own style. Dante and I met in one of the elegant large meeting rooms of the villa. The high frescoed walls set this apart from other office locations. Creating a pen with its own style. Not just another colour of an existing pen. Luigi Poli has left Visconti, and Dante now leads the company. It became clear through our conversation that his passion, creativity and dedication to high standards of quality are the driving forces that have taken Visconti to the level it has achieved. 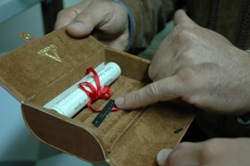 Dante del Vecchio discussed his notes used to arrive at the innovative Divina pen. Innovation continues to be a part of Dante's approach. Over the years some the designs of Visconti pens, as well as the patents awarded, have set the company apart from others. The patents include innovations such as the traveling ink pot, the technical composition of the ink pellets and the Visconti ink well. One particular pen, with an innovative design is the Divina. From the first time I saw the pen profiled in in various pen magazines it stood out as as a very distinctive pen. My appreciation for this pen increased as Dante discussed its origin and design specifications. Through the discussions, he showed his original handwritten notes outlining the concept and design requirements. Complete with notations and even coffee stains, these papers conveyed the creativity that goes into the creation and design of a pen. The Divina, a stunning pen with bands of sterling silver that wrap the pen body and correctly align with the pen cap. Detail is important to Dante. For example, silver bands wrap around the pen in graceful curves. The pen, however, is designed so the bands align when the pen is capped or closed. To ensure the proper alignment Dante designed a specific mechanism to properly position the cap of the pen when closing. The cap itself is shaped so that it fits and aligns correctly when the cap is placed on the end of the pen when in use. This attention to detail and design is an example of what Dante feels is essential in creating a pen that will be truly valued by its owner. This quality and level of design has been recognized. One of the models of the Divina, the Divina HRH received the designation of "2007 Pen of the Year" — the most extraordinary achievement in pens for that year from the magazine Pen World. When asked if he has a favourite pen, the Divina is a pen he holds as special. How did Visconti get started? Passion and an and incredible amount of work. Visconti's first pen, the Classic, was released in 1988. Made of celluloid, the pen has a 14 Kt gold nib and a piston fill method for ink. Back in 1988, Dante, who has owned a pen shop for some ten years, wanted to create pens that would be more reflective of the style of pens that were used by his grandfather. He looked at the pens that were being offered in the market at the time and concluded there was an opportunity to create and produce pens that would be distinctive. 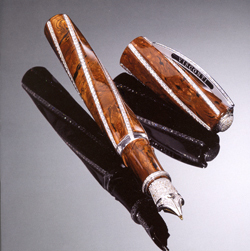 Part of what was so distinctive about the pens he admired was the use of the material celluloid. This material is a combination of nitrocellulose and camphor. It has incredible properties in terms of the visual appearance and durability for use to make pens. Visconti lead in the reintroduction of celluloid for pens. There is great pride in the results of Visconti's achievements to re-discover and reintroduce celluloid as the main material for the construction of pens. 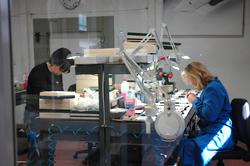 Visconti's employees work on completing work on pens. I saw great attention to detail. 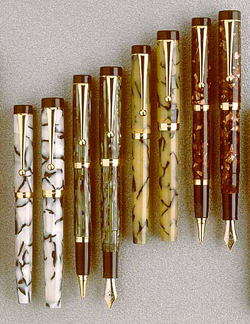 To create pens made of celluloid, Dante extensively researched the art and techniques of working with this material. Celluloid is a difficult material to work with as it can be very brittle at some stages. It also takes many months to finalize the product. Because of the cost, celluloid is typically found in highly valued pens. It was very interesting as Dante showed us the difference in using celluloid sheet stock or celluloid rods in making a pen. Yes there were challenges in the making of the pens. We looked over the old manuals and the complexity of the process stood out. But the research and work certainly paid off in terms of creating a pen with a very distinctive look. 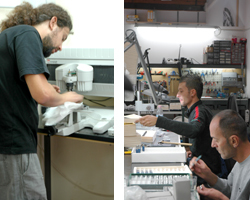 In addition to detailed handwork to create a Visconti pen, modern equipment is on hand to assist with specific processes. The units above are part of an expansion project. 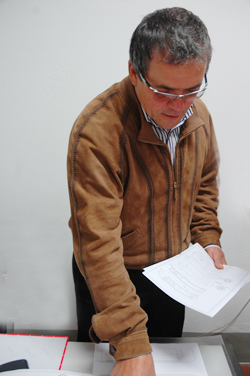 The research and testing of materials extended to other aspects of the construction of a pen. Visconti uses molded ABS for the feeds of the fountain pens as he has concluded this is the best material that guarantees a high level of quality for the important feed mechanism of a fountain pen. As we sat in the meeting room and discussed the history of Visconti we would look over to the presentation case that held the collection of Visconti pens from day one. The "Classic" was Visconti's first pen, created in celluloid, and released in 1988. It is a very attractive pen, piston filled, with a 14 karat gold nib. This noble pen launched the company. In explaining the various processes, precision and timing were evident. 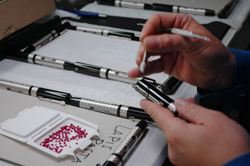 Here, pens are laid out so that small jewels can be adhered to the pen. The material to adhere the jewels has a tight time frame in which to work with. In the following year the "Replica", also in celluloid, was released and this line also had a ball point pen available. From that time, distinctive, quality pens were released each year. The company first started under the name of Office Dream, selling office accessories such as Filofax supplies as well as pens. It is quite the undertaking to start a company from scratch and this broader base of business was required until the pen business would be sufficient to be the primary area of business. As this change occurred, the company became known as Visconti. 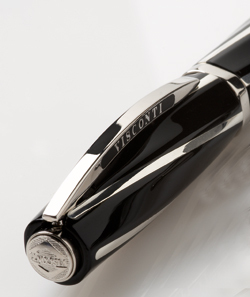 The clip of the Visconti pen signifies a bridge, a unifying structure that brings people together. As we talked about the various pens, it was clear that every Visconti pen starts with a creative idea, an idea linked with art, archeology, philosophy or history. Fusion with the personal creativity of Dante del Vecchio and his designers, history and important events, has resulted in an impressive line of Visconti pens. Some of the designs are truly innovative and sets Visconti apart from other pen companies. The design and the final construction of the pens involves consideration for the needs of the multitude of parts that are required. There is so much more than just a pen body and a nib. We talked about the Visconti clip which is a distinctive aspect of their pens. Dante explained how the clip represents a bridge, a symbol of friendship, a union between the people. The bridge is symbolic of unifying, and this, he explains, is also the task and role of the pen. Later we walked through the room that holds the screws, pistons, pins, springs, sleeves, rings, clips and other parts that make up each pen. The magnitude of parts became very evident and something I had not appreciated. Boxes were all bar coded for inventory control. As Dante noted, while it takes passion and creativity to create a remarkable pen; all this must be balanced with good business principles. Passion and creativity to create, balanced with business principles. By looking at the various stages of production, good business practices were evident. Control sheets accompany the trays of pens and parts at all stages. Processes and the status of production can be tracked at any point. 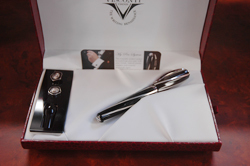 As part of creating a item of value, Visconti puts care into the presentation and packaging for their pens. There is not only the ability to track the status and process stages of the manufacturing of the pens, but also for individual vendors to track the status of shipments. Using on-line technology vendors can know the status of a individual pen being returned or a shipment to be delivered. A commitment to quality was very evident as we spoke and walked about meeting the Visconti employees. This commitment has paid off and Visconti is proud of its low return rate for repairs. From Dante's perspective, quality is an all or nothing proposition. Packing is an important part of the Visconti pen. Here small replica desks are used to hold the Ragtime and the unique individual gemstones for the unique My Pen System. At Visconti there are no degrees of quality accepted. Quality is an all or nothing proposition. Visconti holds great pride in its heritage and the city of Florence (Firenze). As those who have visited this city know, Florence is a leading centre of art with a rich history. Rather than advance a "made in Italy" marketing approach, Visconti focuses on being made in Florence. Some manufacturing work is subcontracted out to artisans and manufacturers residing in Florence. The pen nibs, while produced in Germany, are made with moulds owned, and to the specifications set, by Visconti. Some of the Visconti nibs, for example, have a the small crescent shaped hole, an exclusive aspect to their pens, and part of the design specifications set by the company. The deep connection with Florence is evident in the pens that have been created. The Uffizi Limited Edition, issued in 1993, is a beautiful pen in green celluloid and sterling silver. It was issued to celebrate the importance of the Uffizi on the occasion of the terrible bombing of the gallery. The Uffizi Special Reserve, 50 pens issued to note the 50 days of closure of the Uffizi following the bombing, represent the importance of Florence to this company. From the sales, Visconti made a contribution to the Uffizi to assist in the reconstruction. There is a considerable amount of hand work to create a Visconti pen. 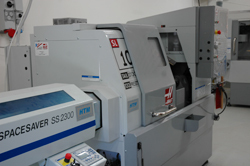 In touring the production area, the degree of detail in the polishing and finishing of the parts were very evident. To allow for the degree of concentration required, employee work shifts are arranged so that employees have a balance of specific work time to ensure quality work. Balanced work shifts help to ensure quality. We walked through all the various stages of design and production. 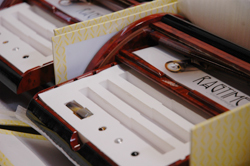 The final area in the process is the packaging area where pens are checked and packaged in handsome presentation boxes. Walking through the areas and meeting the employees of Visconti. Back in the parts room, I saw the great pride of Dante as he showed me the first box he designed for a Visconti pen. An attractive box, it ist covered with Florentine paper and has leather gussets. Those materials are so fitting for a pen company from Florence. We also talked about the market. What is the future of the fountain pen? Create a pen that holds personal value. A great future. Dante's approach has been to create pens that hold personal value. Visconti's approach has been to to make well designed pens that stand out as being different from others. The H.R.H (Her Royal Highness) collection, started in 1996, to accomplish a request of the Sultan of Brunei, and dedicated to Princess Diana/ Here the Divina HHR, named 2007 Pen of the Year. With solid roots in Florence, the presence of Visconti pens continues to grow and the pens are available in more than 50 counties. Before I visited Visconti I did not have a Visconti pen in my own collection. But that has all changed. Now I am pleased to say that I have the Divina, the Opera and the Ragtime. The pens have good balance, a distinctive look, and the nibs are smooth. They have quickly become my "pens of note". So I now join the many others who own, use and enjoy their Visconti pens. My correspondence is an expression of me, and I am very very pleased with how my Visconti pens help me in this task. As I use my Visconti pens I have thought of the other grand occasions where a Visconti pen has been used. These include such events as the signing of the NATO-Russia Summit in 2002 or the presentation of the pens to the twenty-five signatories of the European Constitution in 2005. My notes may not be that important yet, but it s great to know of the noble roots! Dante, and the employees at Visconti, thank you all very much for creating such great pens! I appreciate the opportunity to meet with you and the open sharing of information which I have been able to include in this article. Dante was the driving force behind the company. He left Visconti at the end of 2016 due to differences with the majority shareholders of the company.